My weekend was so busy with my kids swimming. The annual intercity parks and recreation conference swim meet was Saturday and Sunday and we were there most of each day watching them compete. I had some proud moments as a parent and I will relish these times with my kids. My daughter set a conference and team record in the butterfly, so her name will go up on the record boards until someone else comes along and eclipses her time. She already has younger girls knocking off her old records from last year. Both my sons did well also, making it to finals on Sunday in a few events. I even brought my sketchbook but didn’t drag it out to draw, mostly because I was up every ten minutes or so watching someone swim. Speaking of which, I have a little more progress on this big painting. 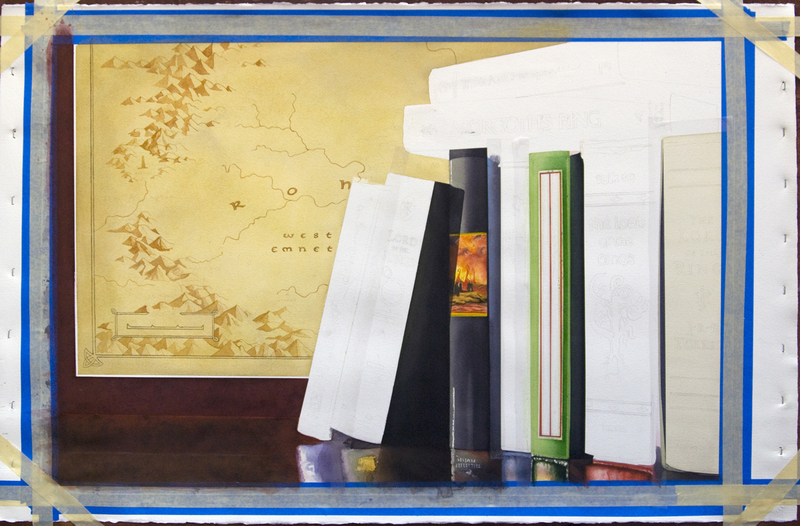 This image shows some development on the background map, and work on the Hobbit book in green. This involved a lot of taping and patience. There is gilding on the real book that wraps the red pin stripes so I had to spend a lot of time on that area and I still don’t have it done. The new watercolor paint I bought from Daniel Smith was used on the gilded elements of the green Hobbit book. I’m tempted to try it on the lettering but the paint is very opaque and getting a nice blend out of it doesn’t seem possible, so I think I’m going to avoid using this antique gold on the rest of the painting. Well I’ve been away from this narrative for a few weeks now, and it seems like it’s been years since I wrote something. Since my last post I participated in my first outdoor art festival and it was a great experience. I took two weeks off of work: the first was spent preparing for the Sugar Creek Arts Festival, the second was getting out of town to visit some good friends. I spent so much time painting that first week and nearly all night framing some originals and prints that I had little to no sleep the night prior to the show, which will never happen again. If it were not for the adrenaline of art festival I would have collapsed around lunchtime. Never again will I try to mat and frame 16 paintings the evening before a show… live and learn. Oh that reminds me, I need to extend a huge thanks to my son Ed for all his help that night. I’d have been sunk without him. The festival was good and I learned a great deal from it. Better preparations are a must and I have to devise a system in which I setup and tear down. I felt my work was strong in comparison to other artists at the festival but my total presentation lacked some. The product range I had for sale was on the slim side and my print offerings were marginal. By the time I setup for my next two shows in August, I will hopefully remedy the print numbers and have a better setup with more new art. My goals then were to finish three large scale originals and fifteen small 5” x 7” originals. I finished one large painting (which I will post along with this), got another half done and started two of the smaller pieces. I did receive a lot of compliments, many from people who don’t know me. This was a big boost in confidence and it really helps in self-assessing my work. I’ve always been a pessimist, especially when it comes to my art. Having complete strangers praise my work was a great feeling and a nice shot in the arm of positive reinforcement. It is not the easiest thing to put all your work out there on the wall and allow thousands of people free reign at it. I’m sure there were plenty of people who thought my work was amateur. Perhaps they are right, I’ve honestly only been painting with serious intent for two years now. I believe there is a piece of art for everyone, and I think the seeds have been planted for my art to grow and find a following that appreciates the style and medium I so much enjoy creating. 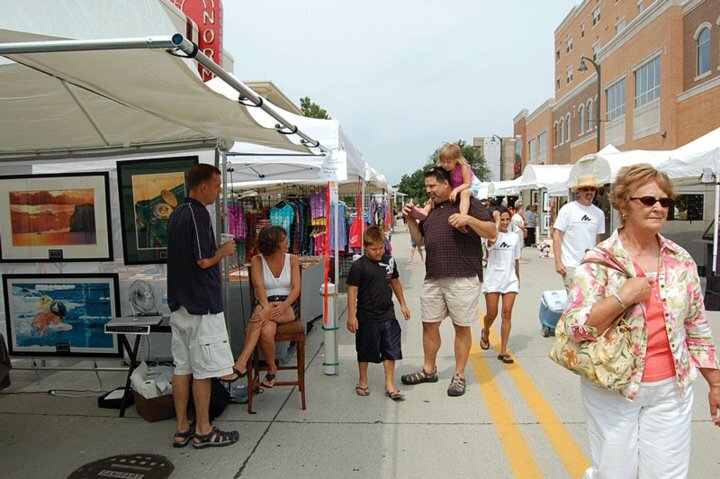 The next two shows; the Washington Fine Art and the Lincoln Art and Balloon Festival are coming fast: http://www.washingtonfinearts.org/News_and_Events.html on August 14-15 and http://www.lincolnillinois.com/ABF.aspx August 27-28. My goals are to double my sales numbers from Sugar Creek, which were pretty modest so I think there is a good possibility of success. Now on to the meat and potatoes. 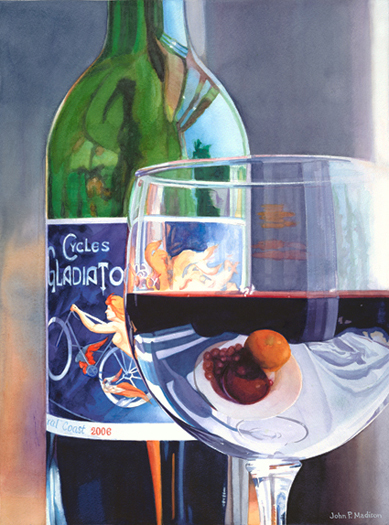 ‘Liquid Gladiators’ is the third in my little wine series. I like how it turned out and really didn’t have too much trouble getting to the end result. All the process and planning came pretty easily and there wasn’t much technically that was challenging. I am ‘wined’ out though and don’t plan on returning back to wine bottles for a long time. I’m about ready to start back up on ‘The Collector’ a painting I really wanted to show at Sugar Creek but simply ran out of time. This is or will be the second of my book paintings. So far, at least technically, it’s my best work to date. I’ve purchased some Daniel Smith Iridescent metallic watercolors and they really are the icing on the cake for this painting. I’ll be posting up progress later in the weekend. For now, it’s painting time.